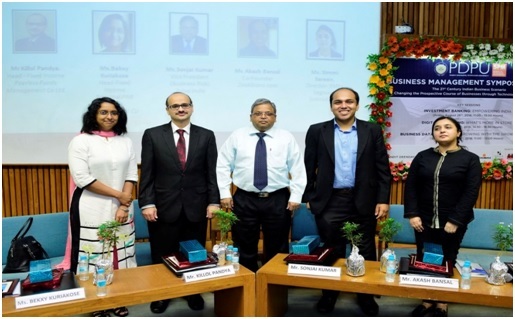 School of Petroleum Management, Pandit Deendayal Petroleum University, Gandhinagar had organised Business Symposium 2016 on 26th and 27th August. The symposium was an attempt to have a deeper understanding of recent trends, market dynamics, issues and challenges faced by the industry across varied sectors. The 2 days Business Management Symposium was divided in 3 sessions as INVESTMENT BANKING, DIGITAL MARKETING and BUSINESS DATA ANALYTICS with speakers and their profiles as mentioned below. The session discussed Indian financial sector and how it is becoming the major catalyst of economic transformation. Experts had past experiences of working in the fields of finance like mutual funds, risk management, start-ups, seed funding, small and medium enterprises, insurance sector, etc. They gave insights about the boom of start-ups in the past two years, stating the helping hand extended by state governments as one of the major propelling factors. The session also discussed about the intricacies and governing the insurance sector, the pivotal role played by mutual funds in the capital market, and also highlighting importance of investment banks and the key challenges faced by developing countries like India and the strategies implemented to combat the same. Speakers: Digital Marketing: What’s more in store? The session discussed how digital marketing is shaping the future of marketing. The session started with the various elements that digital marketing encompasses. The session also discussed how traditional marketing and the need for a presence in the offline market still persists. Key discussion was also on the type and quality of content which has become critical for the success of any digital organisation. The significance of storytelling to engage the consumer and to further make them the consumers who also promote your products was discussed. Simultaneously the panel members also touched upon the technology intervention through virtual & augmented reality in the digital marketing field. 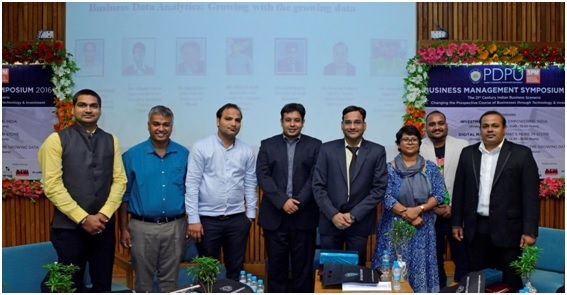 The discussion focused on how the data analytics can be a game changer for various organisations and corporate. Data analytics is gaining popularity because it is that one tool that’s helping things getting measured and managed. Not only e-commerce but also various sectors like health care, investment, politics and many others are using data analytics and companies who have mastered this tool have been able to outperform the competitors. Within the organisation data analytics has permeated in all the functional areas like the supply chain management, sales, human resource management, etc. Increased digitization has lead to consumer leaving data trails everywhere which has resulted in better understanding of consumer behaviour and making it easier for top management to make decisions of their products. Tools like SAS, Hadoop, MATLAB, Statistica and are helping huge volumes of data with more efficient computing capability. The session rounded off on an interesting insight about bridging the gap pertaining to skills between industry and academics. The event was well supported by DEW Journal, Eagle News & divyabhaskar.com as media partners. Dr. Kaushal Kishore, Chairperson, Business Management Symposium 2016 appreciate the sincere efforts of all students and core committee members Mr. Amrit Sharma, Mr. Ashish Kumar Jha , Mr. Ayush Saxena, Mr. Ronak Sani & Ms. Anushri Bhatt.